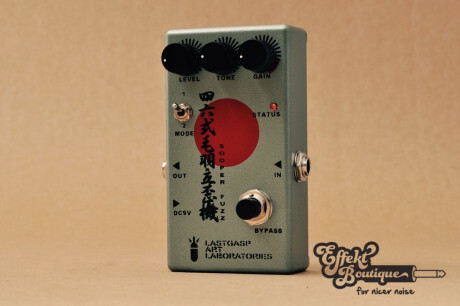 The "Yonroku shiki kebadate hizumaseki - sooper fuzz" is an upper octave fuzz pedal which creates distortion with a range of harmonics. There are two different tone characters which are selected with the MODE switch. The "46" is a succession model of the "Yongo shiki kebarade hizumaseki - super fuzz (45)" whose roots lie in the Japanese fuzz pedals of the 1960s. It is the most exciting and aggressive upper octave fuzz pedal currently available. From the left; "LEVEL", "TONE" and "GAIN". "LEVEL" controls the overall output level when the effect is on. "TONE" controls the tone (turn right to enhance treble). "GAIN" controls the overall gain level. There is a "MODE" switch below the controls. It selects a major tone character. Mode 1 is for the mid boosted sound, and Mode 2 is for the mid notched sound. There is a red zone! When the control points in the red painted area of the Gain control knob, the sound can become very thin and noisy, even if there is no input signal.